Lots happening Muybridge-wise in the UK over the next few months. Here are some of the events taking place during September and October. More details as they emerge. First major UK retrospective of Muybridge’s entire career. Public launch of the Muybridge in Kingston exhibitions with special events for all the family, including a magic lantern show from Professor Heard, shadow puppetry from Zannie Fraser and an evening launch lecture on Muybridge’s links to the history of the moving and projected image by Muybridge expert Stephen Herbert. All welcome – no booking required. 13 pieces, 17 feet is a monologue in thirteen parts that finds its point of departure in Muybridge’s extraordinary 1878 San Francisco panorama. An evening of Muybridge-inspired events. Visit htpp://www.tate.org.uk/britain for further details. Exploring Muybridge’s influence on contemporary arts practitioners. Evening lecture series offering unique insights into the relationship between Muybridge’s work and the history of visuality, film and animation. These copies all belonged to Will Day. 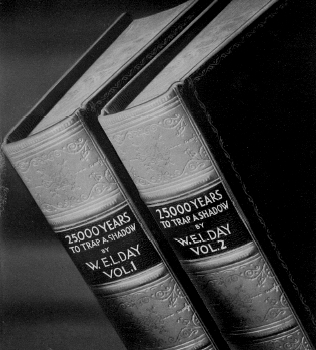 The Chapter details shown here are from the two-volume book 25,000 Years to Trap a Shadow, by Wilfred E. L. Day. The picture of the book is an artist’s impression – it was never published. Will Day (1873-1936), for those who haven’t come across him, was involved in the early days of cinema as a travelling showman, became a major figure in the British cinema equipment industry – and tried his hand much less successfully in production. Fascinated , to the level of obsession necessary for a dedicated collector without substantial financial resources, he accumulated a large collection of material relating to pre-cinema and the early days of the film industry. In the 1920s this was shown in a back room of his shop in London’s Lisle Street. He was the foremost champion of the claims of William Friese Greene to be acknowledged as the ‘inventor’ of cinema. Day went into the radio business in the 20s, and was a key player in the very early days of television, in partnership with John Logie Baird, and was at one time co-patentee of television. All the time his interest in the origins of cinematography continued, his collection eventually being displayed in a special gallery in the Science Museum, London. The prestige enabled Day to add many items. 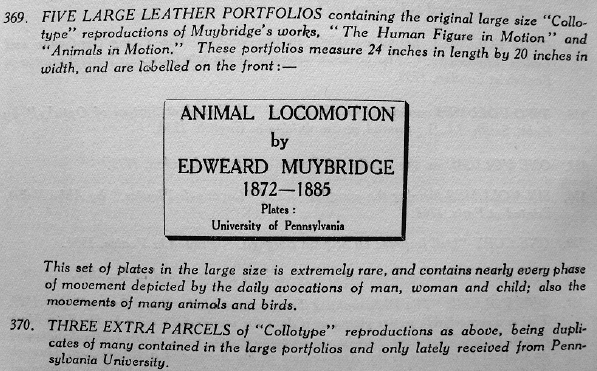 The collection included several Muybridge publications. 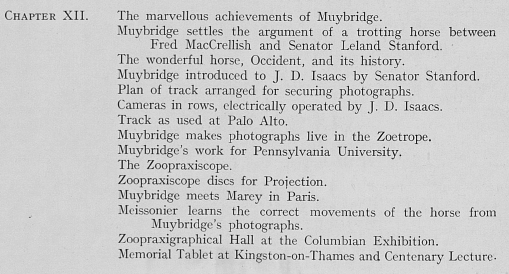 In 1931, Day gave a speech at the unveiling of the memorial tablet in Kingston Museum, and around that time donated a zoetrope to the museum, with a copy of an original picture strip of a silhouette sequence of a Muybridge galloping horse. 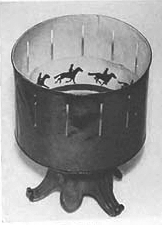 He was keen that the motion aspects of Muybridge’s work should be seen by visitors, and suggested that the zoetrope could be worked by a handle. It was never installed. I believe that a phenkistiscope moving image disc (mid 19th-century) in the Kingston Collection was also provided by Will Day. Day’s collection at one time included a lens that had purportedly been used by Muybridge – I’m currently researching that particular item. His book was compiled during the same period, but Day was not a professional writer and it never did quite shape up into a publishable script. He tried to sell his collection in the mid 30s, and a catalogue was compiled and printed, but the sale didn’t happen. Day had sold out his television patent after becoming exasperated by Baird and perhaps realizing that it would not be a paying business for many years. He helped at the Forty Years of Cinema celebrations at the Regent Street Polytechnic in London in the spring of 1936, but by then he was tired and ill. He died just weeks later. In the fifties his sons offered to sell his collection to the nation, but the necessary funding was not made available. It was purchased by the French Government, and now forms an important part of the French national collections on early and pre-cinema. The manuscript and typescripts of the book (in several drafts) are in the Bibliotheque du film (BiFi) in Paris and accessible to researchers. I have not read the Muybridge chapter. 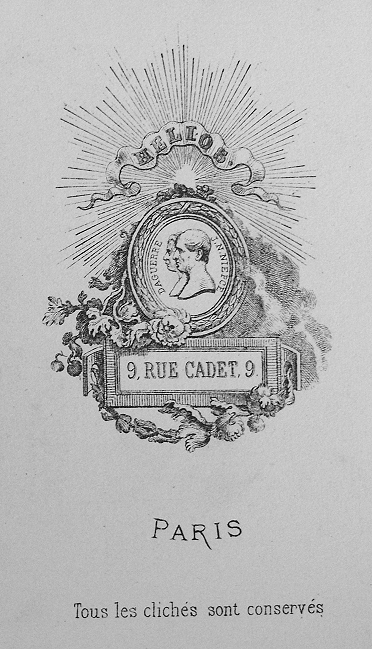 ‘Le mouvement continué’ catalogue number 1201. Inv. 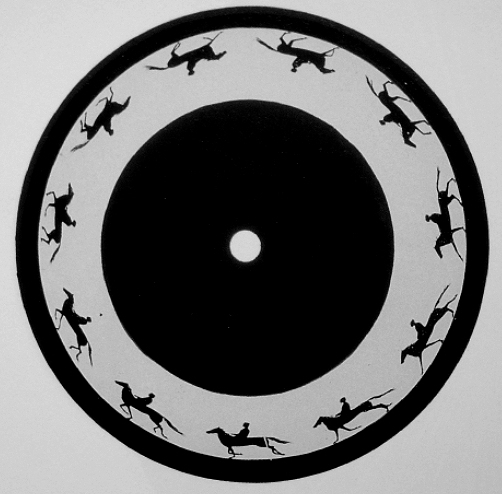 AP-95-1731 (W. Day) Glass disc painted with 11 phases of a horse and rider in motion. Accompanied by a metal shutter disc, with 12 slots. A 16-inch Zoopraxiscope disc, once displayed in the Will Day section of the Science Museum, went to France with his collection, and is now on display in the Cinema Museum in Paris. It is not known how this came to be released from the Kingston Collection. The disc, showing a cantering horse, is seen in Day’s catalogue (there were two editions). The illustration here is from a book by Laurent Mannoni. This catalogue describes (accurately) and illustrates all of the items of equipment (including phenakistiscope discs, etc) from the Will Day Collection. Will Day, ‘The Portrayal of Movement. History of Cinematography. From Camera Obscura to the Living picture’. The Times, 19 March 1929. This publication includes essays on the books, films, and other items in the Will Day Collection, researched in recent years by French scholars. I was tempted to follow the journalistic tradition and title this post ‘Patently Obvious’ but I resisted. Now Patents aren’t everyone’s favourite reading material, but they do of course contain important information pertinent to the work of inventors, and can also lead to clues as to what they were doing with their lives at a particular time. Following on from the possible ‘French Connection’ of my previous post, comes news of a previously undiscovered (perhaps) French patent, most likely for Muybridge’s – or rather Muygridge’s – printing invention (which I haven’t yet got to grips with). It’s listed in the Index volume of the Bulletin des Lois (Bulletin of Laws) for 1865, which apparently includes material dated up to the end of December 1863. The patent was most likely granted in 1862 – but this is not yet confirmed. There’s also another French patent that I haven’t seen listed, 121743 of 21 December 1877; also in the Bulletin, 1879 edition. Most likely this was for his clock synchronizing system. I’m gradually putting together this patent information on a new webpage at The Compleat Muybridge. If technical jargon is your thing, enjoy. The exhibition Helios: Eadweard Muybridge in a Time of Change, at the Corcoran Gallery, Washington, (which ended recently) has brought to light a major problem with our understanding of the early work. In the 1860s, Muybridge adopted the name ‘Helios’ for the publication of his photographs. Some photographs bear the name scratched into the image. It has always been assumed that this was simply a pseudonym, but photohistorian Weston Naef has claimed that Muybridge bought negatives by others, including Carleton Watkins, selling the prints under the Helios label – which was essentially a ‘studio name’ rather than a pseudonym. Naef’s arguments include the suggestion that many of the early photographs are too accomplished to have been taken by someone who had been in the business for such a short time, and that there is no evidence that Muybridge commenced photography before his return to the USA in 1866. There is also solid evidence that some ‘Muybridge’ and ‘Helios’ photographs should be attributed to others. I shall be taking a look at those claims over the coming weeks, as time allows. In the meantime, a short story about one of my web searches….. This possible French ‘Helios’ connection is tantalising enough, but it doesn’t stop there. Anyone familiar with Muybridge’s landscape and travel photography will, of course, recognize this technique as one extensively used by Muybridge a few years later – he even constructed and patented a ‘sky shade’ to make the procedure easier. 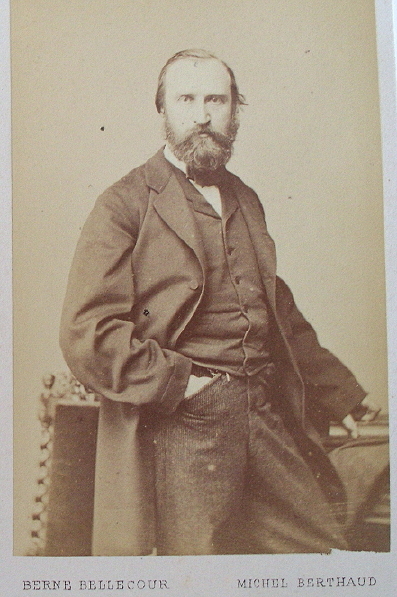 After his 1859 move to London, Silvy quickly became prominent as a fashionable society portrait photographer, at 32 Porchester Terrace, a studio he called — Helios House. 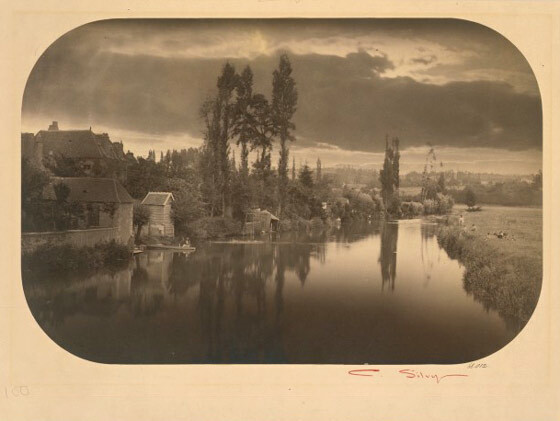 Apart from the portraits, Silvy created series of studies of light and weather, street scenes, and photographic reproductions of manuscripts – and was an inventor of machines (he would eventually create a panoramic camera). Again, anyone accustomed Muybridge’s work will immediately note the parallels in all of the above. In addition, Silvy experimented in making print runs of photographs in ink, at about the time that Muybridge was applying for a patent – apparently, though this is a mystery in itself, which I’m investigating – for his own printing method. All of the above is circumstantial evidence at best, and proves nothing. But it certainly indicates that there are places to look in an attempt to find out what Muybridge was doing in Europe – including a possibility that he was already deeply involved in photography – in the ‘lost years’ of 1861-66. And if indeed he was involved in a photographic studio then a letter, or dusty ledger, or account book, or agreement … some scrap that’s survived the century and a half between then and now, is out there waiting to be discovered, somewhere. Somewhere…. In the meantime, with impeccable timing an exhibition, Camille Silvy – Photographer of Modern Life, opened at the National Portrait Gallery, London, on 15 July. Drawing of Muybridge c.1890 by Hastings resident Harry Furniss, published in 1914. 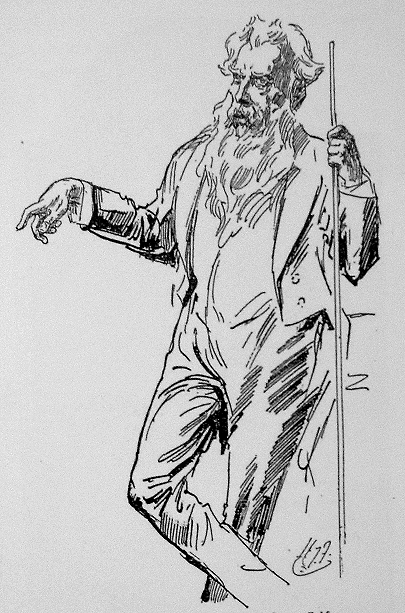 Furniss was also a lantern lecturer of note, who toured the country with his shows featuring political cartoons. About once a week I cycle past Warrior Gardens, Warrior Square St Leonards, next door to my adopted ‘home town’ of Hastings on England’s South Coast. I didn’t know until recently that some of the flower beds were once the location of the Royal Concert Hall, dating from the 1870s. And this week, I discovered that Muybridge lectured there in 1890. I had always thought it odd that he listed no south-east coastal towns in his promotional brochures – perhaps they weren’t too successful, and he didn’t have any really positive newspaper reports to quote for his advertisements. Some years ago I spent several days trawling provincial papers at Colindale (BL Newspaper Library), mostly following up clues from his own writings about where he’d lectured, and I found reports on most of the shows that I was looking for – though it was hard work for few returns – maybe a couple of lecture dates and a report or two for an afternoon’s work and five hours’ travel, if I was very lucky. I never did get to look at the papers for the South Coast. The results of my searches were incorporated into my essay ‘Projecting the Living Image’, published in Eadweard Muybridge. The Kingston Museum Bequest, in 2004. A few straggling lectures have turned up since through digital searching, but this is the first for a while. It popped up during a random Google trawl for “Muybridge 1895”. I stumbled upon this extraordinary website about Victorian photographers in Sussex – and the advertisement for his lectures. Reserved Seats, 2s.6d. ; Second Seats, 2s. ; and Third Seats, 1s. – (etc) Each lecture treats a separate matter, and the two complete the subject…. Children Half-price. First and Second Seats Reserved for Schools at half-price. Hastings and St Leonards News, 9 May 1890. So, off to Hastings Library to find a report of the talk. I haven’t yet found an account of the evening lecture, but the afternoon show seems to have been a bit of a washout. 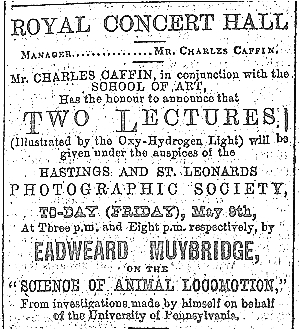 The Hastings and St. Leonards Observer reported on the 10th: “The lecture, which was illustrated with views from the zoophaxiscope [sic] (which instrument is a wonderful invention of his own) was rather poorly attended, even considering the bad state of the weather.” A brief description of the presentation followed. So that’s another one (or rather two) to add to the list. Back in America in 1892 he claimed to have just returned from Europe after giving 200 lectures – so there are more to be found. 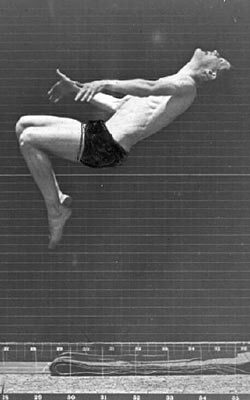 Biomechanics has taken many long strides since Muybridge’s pioneering photography, which does not always receive the scientific credit that it deserves. The important scientific nature of Muybridge’s work is often misrepresented and sometimes totally dismissed. Although the scientific aspects were to some degree supervised at the University of Pennyslvania, his work for Stanford at Palo Alto (despite the later involvement of Dr. Stillman) was not. 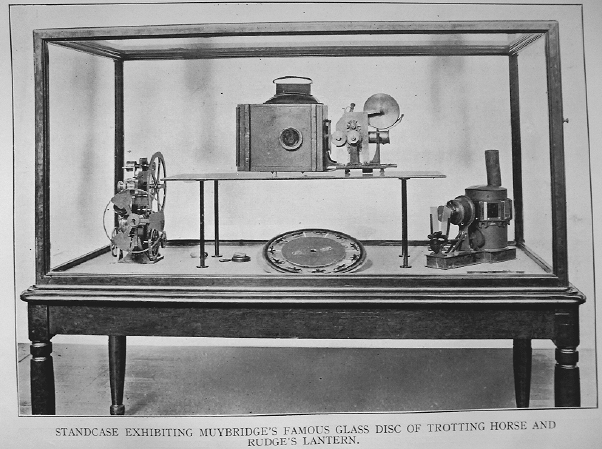 And it was here that Muybridge’s first significant scientific work was undertaken and successfully achieved. Much has been made in recent writings about the grids used at Pennsylvania, dismissing them as ‘unscientific’ – and unsupportable statements made that his use of multiple cameras was ‘unscientific’ compared with the use of a single-lens camera by Marey, today’s writers making statements apparently based on the subjective writings and comments of Muybridge’s contemporaries. We shall be examining these subjects in later blog postings. In the meantime, it’s good to see that the Helios exhibition in Washington has attracted some attention from modern practitioners of biomedical science, such as the following, extracted from the blog of prominent sports podiatrist Stephen Pribut. Artists and scientists have long had an interest in human anatomy and motion. Over the last 50 years, movement and gait have been analyzed using gait plates, computer force distribution systems, electromyogram (EMG) and video. When, where and how did modern analytic methods develop? What was their antecedent? Most textbooks and articles are skimpy at best about much of the early history of the study of locomotion and movement. The science of biomechanics has forgotten about the 19th century developments that made for rapid progress in the last 100 years. The historical memories of biomechanics seem to start in the 20th century with Morton’s observations, and Elftman, Inman and Mann’s theories. Artists, however, remember Muybridge, and going further back, it is clear that Michelangelo was deeply interested in anatomy and Leonardo (performed dissections and) wanted to know how everything worked. Along the way to the present, many other artists and scientists studied and observed animal and human movement. But until the late 19th century there was no technology available to capture data and information of movement. Eadweard Muybridge (1830-1904) was the first to systematically develop equipment and techniques to photograph the movement of quadripedal and bipedal gait along with a variety of other movements, motions, and human athletic activities…. both the methodical study of movement and a film industry had their beginnings with the work of Muybridge. Roger A. Mann, M.D. and John Hagy, O.R.E. Sports Podiatrist, Stephen Pribut, D.P.M. hosts one of the first sports medicine injury websites, which has been online since 1995. The site focuses primarily on Running Injuries. Dr. Pribut is a Clinical Assistant Professor of Surgery and faculty member of the George Washington University Medical School. Dr. Pribut’s sports podiatric medicine practice is located in Washington, DC. He is a past president of the American Academy of Podiatric Sports Medicine. Stephen Pribut was the Chief Internet Engineer of the American Podiatric Medical Association and responsible for all aspects of the APMA’s Internet undertakings including online continuing medical education, web design, usability, information architecture, streaming media, and server installation and maintenance on multiple platforms. His early interest in the Internet for communication, information transfer, and knowledge based services continues with both the traditional web and Web 2.0 Social Media. Dr. Pribut has written and lectured on a variety of articles on athletic injuries, and biomechanics, and lectures both locally and nationally. He has published extensively on both medical and Internet related topics. Professional memberships include the American Association for the Advancement of Science (AAAS). Charles Ducroquet, a Paris physician, spent the better part of his life studying limping. He took films in the open air, processing them himself, while the patient waited. Later, he inspired his sons to continue the work, culminating in the book Walking and Limping: A study of Normal and Pathological Walking (JB Lipincott Co. 1965).